Think Russell Westbrook enjoys playing without Durant? Uh, yes he does. 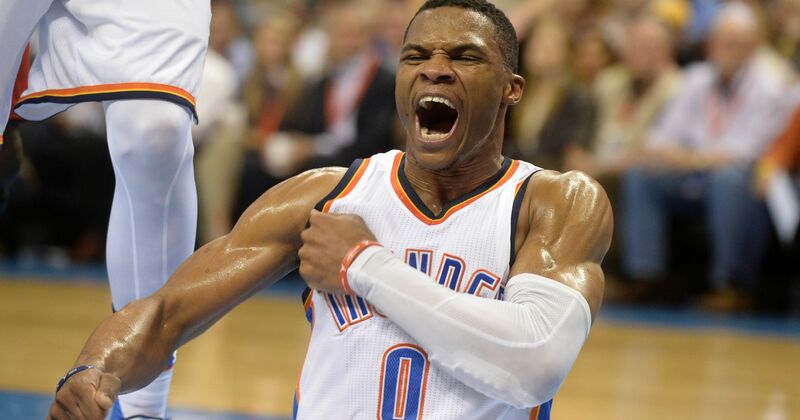 Russell Westbrook went for 51-13-10 tonight. On a related note, he took 44-shots in 45-minutes. That is all. NBA players spending $500 for glasses that don’t work? Yeah, seems about right. Posted: April 10, 2016 in Funny Photos, Humor, Opinion, Sports, Things I Hate, WTF? As some of you may know, there’s a fashion trend among many idiot posers of the world pro athletes and actors in which the point is to apparently look as stupid as humanly possible. I’m talking about ugly clothes, junior high backpacks and glasses without lenses. That’s right, I said glasses without lenses. This fashion trend is called “Nerd Chic”, which is an oxymoron if I ever heard one. Speaking of morons, here’s Dwyane (my mother didn’t know how to spell Duane) Wade after a recent loss to the Celtics. Know why I like Charles Barkley? Because he says things I wish I could say on national TV. Posted: February 1, 2013 in Assclowns, Sports, WTF? 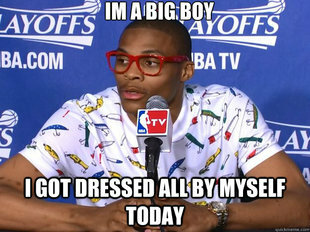 Russell Westbrook. Another petulant, babied, spoiled professional athlete. Not the least bit self-aware. And brah, whoever’s dressing you needs to be slapped in the piehole.